Hamilton Precision Metals, one of six businesses within AMETEK Specialty Metal Products, is among the world’s leading producers of rolled strip and foil. 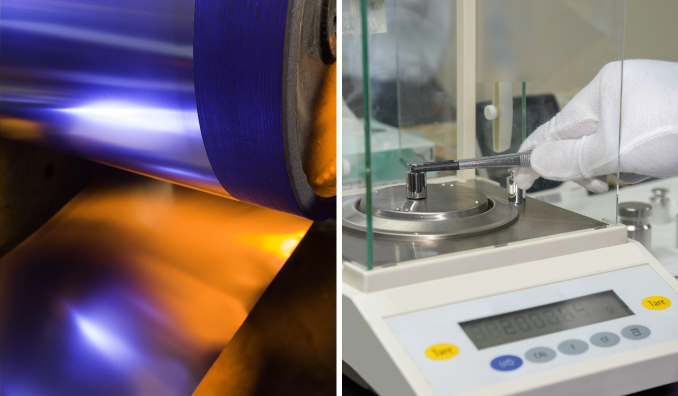 Hamilton re-rolls a wide range of alloys and specialty metals to some of the tightest tolerances and thinnest gages in the industry - from 1.5mm (.060”) to 1.5 microns (.000060”) in thickness. At the InterWeighing 2018 trade show in China earlier this year, Hamilton promoted its particular expertise in rolling precision resistor alloy foil used to manufacture strain gages for load cells and other strain-sensing devices. Hamilton sees a growing demand for its specialty product range in Asia, generally, and in China, specifically. At InterWeighing, Hamilton Precision Metals promoted in particular its Evanohm® R product, a unique nickel-based alloy. Evanohm® R contains chromium (20.0%), aluminum (2.8%), copper (2.0%), silicon (1.0%), manganese (.90%) and zirconium (.08%). Characterized by its high electrical resistivity and very low temperature coefficient of resistivity (TCR), Evanohm® R is ideally suited for strain gages for the pharmaceutical market, one of Hamilton’s biggest markets in China. Evanohm® R is available from Hamilton as foil and strip product in thicknesses from .0005” to .010” and in widths up to 12.0” maximum. It is available in foil as thin as .000080” in widths of 4.0” maximum. Constantan, another of Hamilton’s specialty metal alloys is used extensively for foil resistors and strain gages. Constantan, a copper-nickel alloy, contains specific minor amounts of additional elements to achieve precise values for its TCR. Careful control of melting and conversion practices results in a very low level of pinholes at ultra-thin thicknesses, and its TCR can be adjusted from the furnished cold rolled values by using a low-temperature heat treatment to achieve compensation for all types of spring elements. Strain gages for the pharmaceutical industry represent only one of the many markets Hamilton serves. Within the medical sector, it has more than a decade of experience supplying metal-forming companies that make the hermetic shields and cans for the leading pacemaker, drug-infusion pump and electronic implant manufacturers around the world. CP Grade 1 Titanium is the preferred material due to its light weight, biocompatibility and ability to be deep-drawn into the desired shape and electron beam welded to provide a hermetic seal. For the aerospace sector, in which Hamilton has some 20 years of experience, it rolls .0001" to .0004" (.0025mm to .01mm) thick precision brazing foil used in the production of jet engine fan blades and housings. Placed between the inner and outer skins on both sides of a metal honeycomb, the brazing foil joins critical parts of the engine. Using heat and pressure, the skin and honeycomb are sandwiched into strong, structural components. Hamilton products, in fact, are found in scales at supermarkets, aboard the satellites that circle the globe and designed into automotive sensors. Its alloys are surgically implanted in the form of medical cans and integrated into the electronics of PCs and televisions. They are made into diaphragms, membrane switches, metal stampings, electronic connectors and more. Precision strip slitters, with thickness ranges of .0004" to .075", to slit strip to a minimum width of .029" with excellent control of camber and burr, as well as foil slitters, built in-house, to slit foil as thin as .000060" to widths as narrow as .010"
Hamilton Precision Metals has a long history. It began in 1939 as an offshoot of the Hamilton Watch Company. In 1942, it began selling precision strip and foil to other companies and has been developing that business ever since. Acquired by AMETEK in 2007, Hamilton today has a truly global presence and is the leading specialty re-roller of nearly every alloy made. Its sister businesses within the AMETEK Specialty Metal Products division, formed in 2015, include Superior Tube and UK-based Fine Tubes, industry-leading precision tube manufacturers; AMETEK SMP Eighty Four, specialists in the production of water atomized powders and roll-bonded clad metal products; AMETEK SMP Wallingford, pioneering expert in high- purity metal strip, wire and engineered shaped components; and Reading Alloys, a leader in the design, development and production of master alloys and advanced engineered materials. In short, AMETEK SMP has an unrivalled, added-value service offering based on the long record of each one of its constituent businesses, including Hamilton Precision Metals, in developing specialist products for situations in which failure is not an option.